Shoot high-quality images and 1080p full-HD and 3D video. Whether you’re using a mid-range DSLR, HD camcorder, or 3D camera, you’ll be able to leverage the latest photo and video features available for shooting high-quality images and stunning 1080p full-HD and 3D video. Capture extended lengths of video with high-capacity options. With growing HD, 3D, and 4K video capabilities, you need high-performance cards you can rely on, and high-capacity options to keep you shooting longer without changing cards. 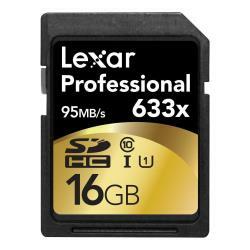 The Lexar Professional 633x SDXC UHS-I card makes that easy, providing you with large capacity options up to 512GB. Save time with dramatically accelerated workflow. The high-speed performance of Lexar Professional 633x SDHC/SDXC UHS-I cards dramatically accelerate your workflow from start to finish, so you can save time and get back to the business of photography. Recover files with Image Rescue® software. Professional 633x SDHC/SDXC UHS-I cards include the latest version of Image Rescue® software. Image Rescue recovers most photo and select video files, even if they’ve been erased or the card has been corrupted. ** The software is available for free download with purchase of the card.